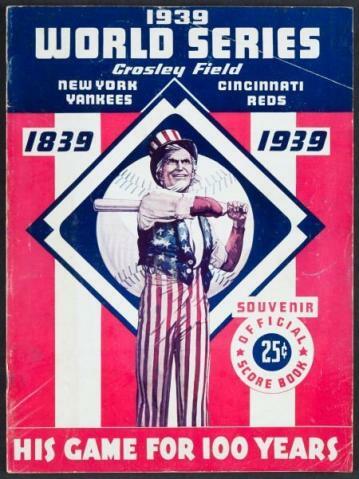 This is an official game program from the 1939 World Series played between the New York Yankees and Cincinnati Reds. 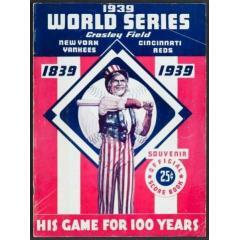 This is an original, unscored program from that series - which coincided with the 100th Anniversary of Baseball. This piece exhibits "Very Good" quality throughout and would display well in your home, office or any room in which you show your historic baseball collectibles. This is a rare find and would make a great addition to any collection. Due to the singular nature of this item we must charge your credit card for the full amount immediately upon taking your order. This policy ensures we reserve the program for you. We will confirm your order by Email. Please allow at least 2 weeks for delivery.